The Weihrauch HW97KT is one of the most effective underlever air rifles on the market today with the ability to be both a high powered field target air rifle and an accurate pest control air rifle. Versatility is the name of the game here thanks to the 97KT shooting at around 11.5ft/lbs, just under the legal limit. This high power leads to flatter pellet trajectories and also high energy transfer into the target for one shot kills. The 97KT uses Weihrauchs now legendary two stage Rekord trigger which is crisp and precise and not only gives you a sense of control over your shot placement but also how well the rifle was made. The rifle has been built with an integrated automatic cross bolt safety & anti beartrap mechanism for added security. 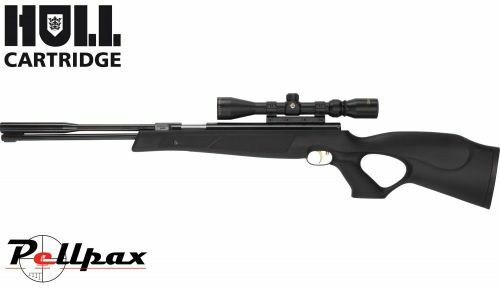 This air rifle is not just a great shooter but also looks fantastic thanks to its flowing, ergonomic stock and blued action which gives a rich colour and deep finish, photos do not do it justice!. Add this item to your basket & spend an extra £100.01 to apply for finance.